Do you really know how to read, comprehend, and decipher the nutrition labels on your favorite foods? If not, that’s okay, most people don’t, in fact, most trainers don’t know either. My clients are always asking me questions about products, if they are “good” or “bad,” whether they can eat it, and if it’ll help them lose weight. I always ask, “did you read the nutrition label?” they’ll usually send me a photo because they have NO CLUE how to decipher the random little label with what seems to be random numbers, and odd percentages. Truth is, most “healthy-foods” are advertised using buzz words like, “sugar-free,” “organic,” “gluten-free”, “antioxidants” and my favorite, “fat-free” however, the numbers within the labels don’t back their claims. Products with misleading claims are counterproductive to our fitness goals, and derail our overall progress. An easy rule of thumb, is to check “the top 5!” Check the Serving Size, Fat, Carbs (sugars, fibers), Protein & ingredients. Step 1 – Serving size – Serving Size is where so many of us make our first mistake. Back in 2008 I would easily eat a box of Cheez-It Crackers. I never looked at the nutrition label, and really wasn’t concerned. I later read the label and found the actual serving size is just 27 crackers! I was consuming about 11 servings, no surprise why I couldn’t lose my belly. Tip: Serving size should be the first thing to read since it shows you how many tablespoons, cups, or pieces, make up 1 serving. By reading the serving size you’ll know how much to eat, and the nutritional make-up of just 1 serving. Total fat: the total percentage of all fats included in your container. Saturated fat: comes from animal fat products, like cream, cheese, butter, whole dairy, and fatty meats. Trans fat: artificial fats added to vegetable oil to make it more viscous (thick). Cholesterol, which is a waxy, fat-like substance that’s found in all cells in the body. There are 2 types of cholesterol, and your body needs both types of cholesterol to create hormones and enzymes to digest food. Low-density lipoproteins (LDL) – LDL is often referred to as the “bad” cholesterol. This is the kind that clogs arteries and over time can result in major heart issues. High-density lipoproteins (HDL) – HDL is the kind your body wants. Carbs will not make you fat, your body uses carbs for fuel, and energy, so a lack thereof, the more sluggish we become. By cutting carbs we cut the supply of fuel/energy for our organs, nervous system, and fiber needed for healthy digestion. Yes, if you eat carbs excessively you will gain weight, but note, not eating enough carbs can cause your body to work inefficiently. Dietary Fiber – Fiber & carbs go hand & hand, fiber is vital in creating a well-balanced diet. Consuming carbohydrates with higher amounts of fiber will keep your fuller, lowers bad cholesterol levels in your bloodstream, passively aids in weight-loss, and improve the functionality of your digestive system. Eliminating fiber can cause one to become constipated, gain weight, or suffer from heart disease. Tip: The American Dietetic Association recommends 25g of dietary fiber for adult women and 38g for adult men per day. You’ll want to split the daily recommendation throughout a the day. Tip: White sugar is extremely processed, and has been stripped of other nutrients. Look for less-processed sugars such as brown rice sweeteners, honey, agave, molasses, which contains trace minerals such as calcium, potassium, iron and magnesium. Step 4 – Protein – You all know, I LOVE MY PROTEIN. Yes, protein keeps you tight & lean, but protein is essential to your diet, and most people don’t consume enough. Amino acids are the building blocks of protein all of which help our bodies create healthy hair, nails and lean muscle mass. Protein will also regulate your hormones, creates enzymes, and helps with stabilizing your blood. Tip: Choose lean or low-fat cuts of meat like, skinless chicken and turkey breast, lean ground turkey, round or sirloin and ground beef that is at least 90% lean. Trim or drain fat from meat and remove poultry skin. Step 5 – Ingredients – It’s easy, if you cant pronounce it you need to bounce it. All natural, healthy snacks/food should have a simple ingredients list. You shouldn’t have to ask yourself “what’s that?” & if you do, put it back on the shelf. Tip: Less is more! If you cant pronounce the ingredients it’s probably best to not eat it. You’re now equipped to read, decode and decipher “healthy” nutrition labels from those that make false claims. If you become confused remember this rule of thumb, look for foods with no more than five ingredients. Lengthy lists are usually a sign that a product has unnecessary extras such as artificial preservatives. Many packaged foods hide the unhealthy ingredients that will hinder your progress, so pay attention, and do your homework. Just because it claims to be healthy, low fat, low sodium, zero sugars, and fat free it doesn’t mean that it is! I love me a great “treat meal” “cheat meal” and they can be beneficial to your weight loss journey when done strategically and correctly, but there’s a science to incorporating cheats into your healthy lifestyle. You’ll want to cheat strategically to create and maintain a caloric deficit while balancing your hormones that control your appetite. Our appetites are controlled by the ghrelin hormone which stimulates your appetite, and leptin hormone that suppresses your appetite. When you stick to your diet you’ll eventually decrease your leptin while increasing your ghrelin. When you follow, your meal plan your body’s natural appetite suppression decreases over time and triggers you to want to eat more, which is why we frequently eat smaller meals throughout the day. When you create that caloric deficit, your body begins to protect itself so it yearns to eat more. The extra calories/macros from a cheat meal allow your hormone levels to regulate and for your leptin hormone to get back to work. Leptin levels decrease within days of resuming a caloric deficit. To sum it up, when you follow a caloric deficit for long periods of time you’ll increase your ghrelin hormone making you want to eat more, and decrease your leptin hormone that suppresses appetite. By having a treat meal once a week you’ll “reactivate” your leptin hormone (suppresses appetite) so that it work more efficiently. Because leptin decreases shortly after you get back to your nutrition plan (caloric deficit) you want to spike it back up to help suppress your appetite. I’m known for telling my clients, tt’s a cheat meal, not a cheat day, cheat week, cheat month, or cheat season. We use our cheat meals to “boost” and “reignite” our metabolism after we’ve created a caloric deficit. The idea is we want to fulfill our cravings without binging or derailing your progress. One weekend of binging of eating can be counterproductive to week of progress. We work best when we plan, so schedule a day and time that you’ll have your cheat meal. I generally plan treat meals around holidays birthday parties, social events, or date night. Eating post workout helps you recover, so plan to have cheat meals after an intense leg workout, plus the extra calories will go to that BOOTY! Nothing goes together better than, CARBS & FATS, and most cheat meals are high in carbs & fats. Because of this known fact it’s best to save your treat meal post workout. I know both carbs & fats supply our body with energy, but high fats before a workout will slow you down, where high carbs before your workout will make you more effective and energetic in the gym. Never, ever, ever, ever cook your own cheat meal. By cooking at home you may be tempted to eat more or have leftovers, and find yourself cheating well beyond that one meal. Allow yourself the liberty to eat whatever it is you’ve been craving, whether a burger and fries, pizza, spaghetti, tacos, Chinese food, or grilled cheese. Make 1 choice, and EAT IT! Cheat meal or not, overeating is never okay, and portion control is still very important, so when you do become full, stop, and ask the server to remove the plate. These are rules I personally follow, and they’ve helped me drop my 65 pounds, and keep it off. But, I have always been honest with myself. If my nutrition didn’t go as planned during the week, I do not cheat. You have to earn your cheats, you cant eat everything you want, if you do, you will most definitely out cheat and out eat your workouts. The cleaner your diet, the leaner your body, if you don’t have cravings to have a treat meal, don’t have a cheat meal. And most importantly, challenge yourself, prove to yourself that you have self-control and discipline to not stray from what you said you would do, and then cheats will be less important. As a bikini competitor, trainer, and nutrition coach, I’m a strong believer in counting Macros, over calories. I’ve noticed that by understanding how many carbs, fats, and proteins a person needs vs how many calories consumed has educated my clients on portion control, balance and improves their habits around their personal nutrition. My clients have not only lost weight, increased muscle, and dropped their body fat percentage, but also created a healthier lifestyle concerning their food consumption. Food becomes a lot clearer when you consider those 3 categories (carbs, fats, protein) while cooking, meal prepping, and eating out. But, wait, wait, wait, just as our body’s NEED macronutrients, we also need Micronutrients. I’ve witnessed the consequences of how the one-sided focus on macronutrients can lead to the neglect, and deficiency in micronutrients. Micronutrients are the vitamins and minerals we need in relatively small amounts. I remember dating a bodybuilder who had to remind me, “Babe, don’t forget your micros!” it was then that I realized I had totally neglected to actively consume micronutrients. Like in life, our diets cannot consist of “all” “only” “nothing” and “always” and we must create a balanced diet that’s nutrient dense and full of all the good stuff we need. I personally don’t eat very many fruits, and don’t like broccoli because it bloats me, but I also understand there are essential vitamins & minerals in both. I won’t bore you with the science, but do know, to avoid creating a deficiency I take a vitamin supplement like “Nature’s Fuel” found at Nutrishop. Nature’s Fuel is a great vitamin formula because it contains the Vitamins, Minerals, Greens, Amino Acids, and Antioxidants our body’s needs. Keep in mind you may not find a multivitamin that has it all, but I’ve created a check list for what to look for in a great Micronutrient Supplement. We’ve all seen the cute girl, seemingly fit, extremely lean bouncing around on the treadmill, like a cardio queen, but let me tell you, there’s more to weight loss, fat burning, and toning up than cardio! Yes, by spending hours on the treadmill you’ll burn fat thus resulting in a decrease in pounds on the scale. But, your goal should be to build lean muscle so you continue to burn fat well beyond your workout. I’m a fan of both aerobic exercise (cardio), and resistance training (weight lifting), and I genuinely enjoy both. However, you’ll never hear me suggest an all or nothing plan when it comes to the notorious, “should I do cardio or resistance training to lose weight?” question. There are significant benefits to cardio and lifting that are completely different, and increase your overall health and quality of life. A progressive cardio regiment will improve components of your cardiovascular and cardio-respiratory system more aggressively than lifting weights. Where lifting weights will assist in stronger skeletal structure to withstand the wear and tear of life, but will only improve few aspects of your cardio respiratory system. My main goal with everything I do, is to educate you, and empower you to become a better version of yourself, while providing you the tools to do so. Below you’ll find my quick tip list of reasons, benefits, and advice on why a fitness plan that incorporates both cardio & resistance training is the most effective, sustainable, and beneficial than choosing one or the other. Supports Heart Health: The heart is one of our most important organs and muscles in our bodies. Like other muscles we must work that muscle for it to become strong. We allow our heart to become weak when we fail to work it out, and that weakness leads to negative health effects. Improves Memory: Studies have shown that by participating in cardio exercises you can help improve memory & brain health. Just a little workout today, goes a long way in the effects of long-term health. Natural Antidepressant: Cardio releases endorphins that improve moods, fights stress, and helps alleviate depression. Hormones released during cardio also relieve symptoms of fatigue and decrease your appetite. Natural Detox: While performing cardio your body loses all the glycogen (glucose/energy) stored in your liver, followed by stored fat. Keeps Your Arteries Clear: Cardio aids in lowering your low-density lipoprotein (LDL), the “bad,” cholesterol and boosts your high-density lipoprotein (HDL), the “good,” cholesterol. This may result in less buildup of plaques in your arteries. Tip: Healthy adults should complete 30 minutes of moderate-intensity physical activity 3-4 days a week. Try walking for 1 minute, and jogging for 30 seconds. Increase your intensity, speed, and time every 5 days. Increases Post Work-Out Burn: Although you burn 12 calories per minute during cardio compared to 10 minutes during weightlifting, you’ll continue to burn calories well after your resistance training workout. Easy To Incorporate Cardio: Include plyometrics like squat jumps in between sets. Squat jumps will leave you breathless and help strengthen your heart and lungs along with your other muscles. Builds Lean Muscle Mass: By increasing your lean muscle mass, you’ll burn calories & fat in the body more efficiently. Improves Bone Density: Resistance training can decrease bone loss as you age. The promotion of fat-free body mass will decrease, sarcopenia, the process of losing lean muscle as we age. Increases Strength Beyond The Muscles: By lifting weights you’ll not only increase your muscular strength but increase the strength of connective tissue, muscles, and tendons which results in an improvement in motor performance and decreased injury risk. Tip: Incorporate, Compound Movements. Compound movements are those that engage multiple muscle groups resulting in more calories burned. Try exercises like the squats, push-ups, lunges, planks. Do each exercise for 30 seconds, and increase your time by 10 seconds every 3-5 days. email fitslana@gmail.com to be added to my monthly newsletter for my month squat challenge, tips and tricks that make food & fitness fun. I cringe at the questions because, THERE IS NO SECRET, and to be honest my journey has been 7 years in the making. I didn’t just workout the last 6 months and achieve this body, this is years of commitment, following a routine; years of saying no to fatty foods & being disciplined and sticking to my diet. So, to help you, I’ve created this top 10 list of principles that will leave you fit & lean in just 14 days – #fitslanasleanin14 – These are principles I personally live by, and encourage my clients to incorporate into their daily lives. It’s a simple list that includes 10 points of reference that will help kick start your journey and give you a road map for sustainable weight loss. It’s not easy breaking bad habits, especially those that have been life long, and let’s face it, as Americans we’ve been raised in a FAST FOOD NATION! Just like the addict of crack, heroin and alcohol, we are addicts of fast food, sugars, fats, and the sodium crap that keeps up going back. If you truly want to make a change, follow these steps, commit to each item on the list for at least 14 days and watch your body transform. You’ll notice I never mention working out, cardio, lifting weights or a gym anywhere on this list, because by simply changing your diet you’ll eliminate belly bloating, drop pounds, and increase your energy levels. We all must eat, so let’s fuel our bodies with an adequate amount of nutrient dense ingredients to get our bodies looking toned, lean & tight. Eat 6 small meals & snacks a day, one every 2-3 hours. Eat Meal 1 within your first Hour of waking up, so do not skip breakfast. Eat a portion of carbs & protein with every meal. A portion can be measured/weighed based on your body composition, or when out: protein should be the size of the palm of your hand, and carbs should be the size of your clenched fist. Add a portion of veggies with a least two meals daily. They should not be fried, or drenched in oil. Try steaming, boiling, sautéing, grilling, and baking. Drink water before you eat, drink at least 10 cups of water a day which is 80 ounces – 16 cups is 128 ounces or one gallon, I typically drink a gallon a day. Say no to sugary drinks, and your daily glass of wine or cocktail. Avoid the drive-thru, fast food & refined sugars, instead pack snacks like apples, almonds, beef jerky, gum, and protein shakes for those moments you find yourself hungry and on the go. Have your fruits & fats before 3pm, you want to use those items as energy throughout your day while you’re moving more. Eating them later in the day while slowing down will store them vs burn them. Meal Prep 90% of your meals. Plan your meals ahead by planning meals, and snacks, decide which days you can cook, and know what you’re eating next, before it’s time to eat. Follow a grocery list, and only purchase what you need. Shop the perimeters of the store where you’ll find more nutrient dense ingredients, and avoid center aisles where processed foods high in sugar & full of fat are located. Make your last meal high in protein, with lots of dark greens, add a proper portion of carbs. Go out, and have 1 Cheat Meal a Week this will help break monotony and keep you satisfied, remember it’s one cheat meal, not a cheat day, cheat week, or cheat month! I often hear “I love to eat” “I can’t do that” “I need my food” but eating healthy doesn’t mean you aren’t eating it just means your fueling and feeding your body the necessary nutrients to perform at its optimum level! Think of your body as a car, we spend thousands of dollars on maintenance a year, the right oil, specific gas, brakes, transmission fluid, and we don’t use the cheap stuff. So, don’t use the cheap stuff in your body. If you need help with a more structured meal plan filled with weekly grocery lists, snacks, assigned meals, and recipes, let me calculate your numbers, and design a 4-week nutrition plan that will get you on the right track for success. When I started my weight loss journey back in 2010 I was extremely hesitant and doubted myself. I lost weight fast, and then realized I wanted something more. I didn’t want to just be a fit person, or someone who works out, but I wanted to inspire others, and motivate them to reach their goals. So in December 2013 when the opportunity to leave a dead-end job with pay, presented itself, Not only did I resign happily and begin receiving a pretty cool severance package, but I started planning the rest of my life. In January I began training with a competition prep team for physique shows. 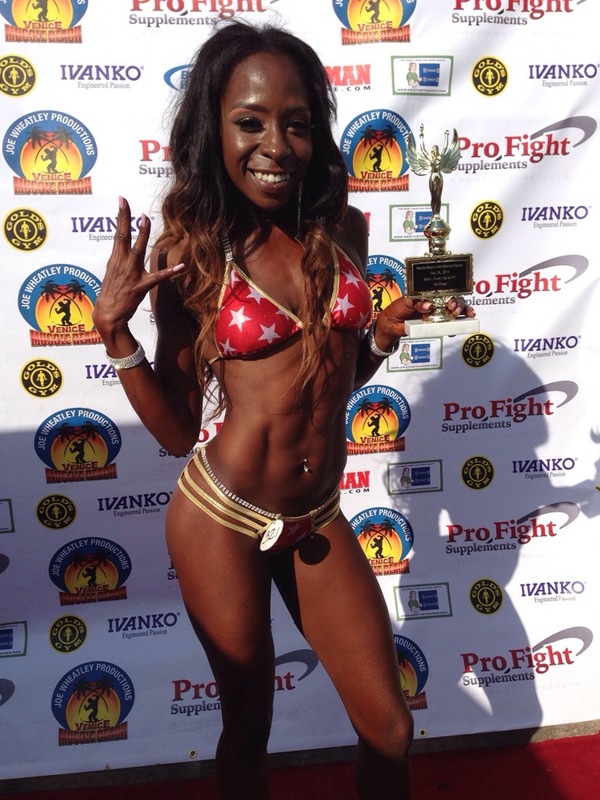 I was extremely intimidated, the girls on Instagram looked like goddess’, there was no way I would ever compete with the likes of Stacie Alexander, or Coryn Salarzer in the NPC. But, I knew I wanted to get on a stage, so I kept going. Fast forward to April, where I started training clients and creating personalized fitness and nutrition plans to help them reach their fitness goals. It was in April that I finally committed to competing! After receiving my first payment in full for a 4 week personal training plan, I submitted my registration for Muscle Beach’s International Classic- Memorial Day! At about 30 days out, I was still very much bloated. I had no idea how I was going to get my body ready for stage, and I definitely didn’t know how to pose, and I didn’t even have a bikini suit idea! Thank God for my girl, Maribel and Tantra444.com – she made it all come together and helped me prepare within just three weeks out from the show! What a wonderful first show! A Cali babe in a bikini at Venice beach it couldn’t be more right! The day was filled with great networking opportunities and of course the opportunity to show off my hard work to the masses! Between 4am make up, 7am check in, 930 athlete prep, and finally going on stage at 1, it was an extremely exhausting day! When finals started at 5, I wanted to win, I wanted place, but most of all I wanted to eat and drink some water! When Joe Wheatley called my name, “Lana Davis” I wasn’t sure what place I made, but I knew I had placed! The initial shock was quick, ok, I placed, but which place, oh shoot, I out performed girls who do this often! Ahhh! Taking 4th out of 19 in my first showing was the most empowering feeling ever! I’ve had no formal training and pushed myself to new heights. 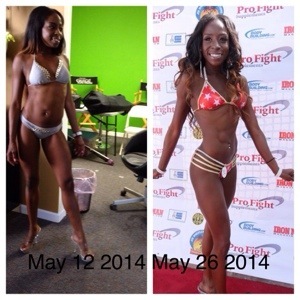 Feeling extremely accomplished I’m even more motivated to compete in the NPC and become a national qualifier! I’m hungry for success, and I see the light at the end of the tunnel. So many people doubted me, questioned me, and had negative things to say, but as I sit here living my dream, on my own time, I’m extremely blessed and soo happy to be Lana Davis! If I told you eating sugar and carbs could help you lose weight, would you believe me? Probably not, but it’s true! Here’s why, every vegetable is made of carbohydrates, and carbs are made of starches, sugars, and fibers. Every piece of asparagus, leaf of spinach, or piece of fruit all have just enough sugar to keep our bodies in a state of circulation providing the energy we need to function. Most people avoid veggies at all cost, or when they do eat veggies they’re breaded, deep-fried, dipped in butter & creamy sauces. Someone once told me they loved veggies, fruit, and salads and how she ate them every day, but still, she couldn’t lose weight. It wasn’t until a lunch date together where I witnessed her order, fried zucchini and a bacon cobb salad drenched in blue cheese dressing; that I learned her idea of veggies meant fried, and covered in fats. Yea, I totally understand, nobody likes veggies, and if we stick to the old recommendations we’d be eating 5 servings a day, and who has time for that! I tell my clients when it comes to veggies, lets focus on less being more, meaning, don’t stress yourself over the 5 servings. But instead, fit in at least 2 servings a day with your other well-balanced meals. Vegetables are nutrient dense and provide our bodies with much needed fiber, antioxidants (which have been shown to help prevent cancer), and complex carbs, and this is all the stuff we need to stay energized throughout the day, and healthy throughout life. We can’t always do what we want, and sometimes we must do the things we least like to help maintain balance in our lives. Whether it’s cardio, box jumps, eliminating liquor or implementing veggies, sometimes a little bit goes a long way, and get us closer to where we want to be! So, the next time you’re in the market have no fear, select some of your least disdained veggies either fresh or frozen and prepare them lightly steamed or raw! Remember, two servings a day goes a very long way, and it’ll help you sheds some pounds.